I'm sure I've blogged on this before. I must have, because it saves time... therefore saving my sanity... but it's still healthy... which (let's be honest here) isn't always my forte. Mommy Lunch: Basically a breadless sandwich. Rolled up meat (with optional mustard for dipping), cheese sticks/slices, and a pickle. Brilliant. I don't have to get the bread out. I don't have to dig the mayo out of the bottom of the jar. There's no soggy sandwich leftovers getting moldy in the fridge because no one will eat the bread now that the mustard has soaked into it. And it's finger food, which the kiddos love. But the other brilliance of a Mommy Lunch is that it's mommy making the lunch, so she gets to deviate from the plan as she wishes. (Especially depending on what the pantry holds.) Because basically, a mommy lunch is what mom wants to make for lunch. However, I can't take the credit. My mom used to make these for us. This is what works for me. 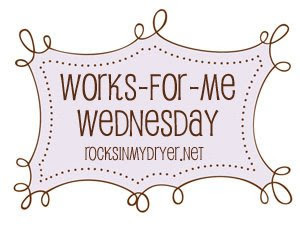 To see other great ideas, head on over to Rocks In My Dryer. How can you not love it- there is a pickle in there! I love you soooo much!!!! Thanks for the great lunch ideas. Do you have any ideas for hotel cooking. I really enjoyed talking to you at church this morning and hope to talk with you again soon.